On this site, in the frontier river settlement of Stillwater, sixty-one delegates from the vast unorganized wilderness west of the St. Croix assembled on August 26, 1848 to hold the Minnesota Territorial Convention. In this convention the name Minnesota was selected and the spelling agreed upon, at petition was drawn, memorializing Congress to set up a territorial government, and H.H. Sibley was dispatched to Washington as the delegate of the convention bearing the petition. Erected 1948 by Stillwater Territorial Centennial Committee. Location. 45° 3.386′ N, 92° 48.371′ W. Marker is in Stillwater, Minnesota, in Washington County. Marker is at the intersection of Main Street (State Highway 95) and Myrtle Street, on the right when traveling south on Main Street. Touch for map. 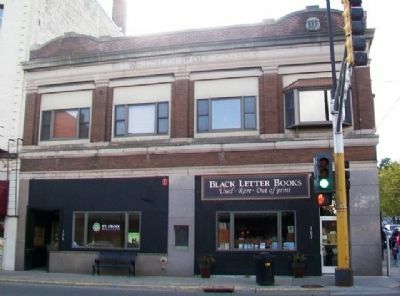 Marker is at or near this postal address: 102-106 South Main Street, Stillwater MN 55082, United States of America. Touch for directions. (a few steps from this marker); 226 East Myrtle Street (within shouting distance of this marker); John Karst Block (within shouting distance of this marker); 114 North Main Street (within shouting distance of this marker); Veterans Memorial (within shouting distance of this marker); Lumbermen's Exchange Building (about 300 feet away, measured in a direct line); Connolly Shoe Company Building (about 400 feet away); 1965 Easter Sunday Floodwater Crest (about 500 feet away). Touch for a list and map of all markers in Stillwater. More about this marker. The Joseph Wolf Company building (1911) contributes to the Stillwater Commercial Historic District (no marker stating such). More. 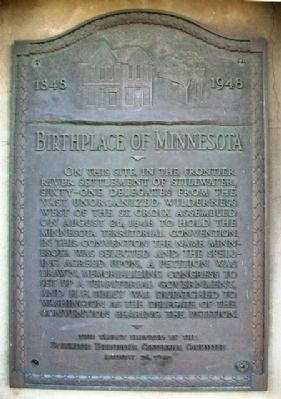 Search the internet for Birthplace of Minnesota. Credits. This page was last revised on June 16, 2016. This page originally submitted on November 6, 2014, by William Fischer, Jr. of Scranton, Pennsylvania. This page has been viewed 284 times since then and 7 times this year. Photos: 1, 2. submitted on November 6, 2014, by William Fischer, Jr. of Scranton, Pennsylvania.